It’s the responsibility of businesses using these innovative systems to ensure staff are equipped to use them to their full potential. In the UK, three-quarters of staff are ‘disengaged’ and the resultant drop in productivity is costing the economy £340 billion a year. So how can employers buck this trend and in doing so, create a motivated and loyal workforce? Defined by Aon Hewitt as ‘the level of an employee’s psychological investment in their organisation’, many forward-thinking organisations are looking to technology to help solve the employee engagement crisis. Intelligent cloud can empower employees to work to their full potential how, when and where they want. However, it’s the responsibility of businesses using these innovative systems to ensure staff are equipped to use them to their full potential. Over half of UK businesses now offer flexible working, challenging traditional perceptions of how a workforce should and can collaborate. Any flexible working strategy should have a well-thought-out plan in place for how disparate employees can work effectively together. Without one, businesses risk undermining teamwork and limiting productivity further. Outdated technology is one of the key barriers in addressing the employee engagement crisis, especially when flexible working is concerned. This means working together but remotely can be frustrating and difficult. Enter intelligent cloud. Of all the technological advancements changing the world of work, intelligent cloud accelerates collaboration while keeping the all-important human element. A collaborative cloud suite creates a seamless working and social environment, allowing people to meet, co-author, create and find content quickly, no matter their location. Equipping staff with the correct technology is therefore key to realising the full benefits of flexible working, including higher staff morale, productivity and ultimately, business growth. Research suggests senior managers spend up to 50 per cent of their time at work in meetings and the majority of these aren’t as productive as they could be. Successful meetings depend on clear insights to boost decision-making capabilities and speed up the process. 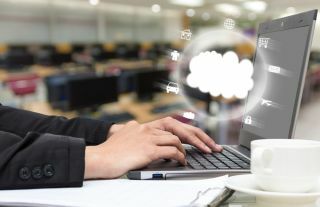 Data insights gained from intelligent cloud products can be particularly useful as it can connect many workplace activities to business outcomes. For example, workplace productivity dashboards can enable senior management to view employee workload and activity data all in one place. Any problems highlighted can be used to inform discussions amongst the C-suite as to how efficiency bottlenecks can be addressed and business processes fine-tuned to increase productivity. Coupled with modern workplace applications, artificial intelligence built into cloud platforms is also opening-up new possibilities, empowering organisations to tackle huge data sets quickly and cost-effectively. For example, Machine Learning is seeking to improve employee experience by allowing individuals and virtual teams to receive tailored search results based on projects they’re actively working on, who they have been working with and what documents they have recently used. Speeding up daily processes and making it easier for employees to manage their workloads while working more effectively as a team has huge benefits when it comes to engagement. With two-thirds of UK workers changing jobs because of a perceived lack of training opportunities, it’s clear a culture of learning is essential for keeping employees engaged and loyal. There’s also the added bonus of receiving greater ROI on investments in new tech if employees are equipped with the knowledge they need to get the most out of it. Businesses need to view training as an expense rather than an investment. Without total employee buy-in, intelligent cloud products won’t be used to their full potential. To incorporate training and development opportunities into your workplace culture, you need to develop a clear strategic roadmap to plot out where you currently fail and where you’d like to be. The roll-out of any new digital tool needs to be smooth. Decide on key dates for applications and systems to be introduced to employees, starting with senior and middle managers first. Focusing on tech-savvy individuals who are likely to land quickly on their feet can also help. A tech-adoption programme led by ‘digital champions’ running alongside deployment will smooth out any resistance or confusion along the way. Ask these individuals to sit down with other employees to explain digital goals and how these will affect their day-to-day work. This will help everyone feel more prepared and change will feel less daunting. Once the initial training programme has come to an end and intelligent cloud becomes part of employees’ everyday experience, it doesn’t mean your job’s done. Training should be viewed as a continuous investment, as with any technology, there will be regular software updates and new product launches. Cyber security is one of the greatest challenges of modern business, with 46 per cent of UK companies experiencing one or more breaches in the past 12 months. However, it is often left up to the I.T department and the C-suite to protect the business. As more and more businesses embrace flexible working, this cultural change must be matched by an equally modern approach to security and risk management which includes everyone in the business. Intelligent cloud platforms can make cyber security easier by leveraging machine learning capabilities and providing risk-based conditional access based on factors like the user, location (geo-location or IP address), device and application, avoiding any unnecessary disruption. Core devices are not your only concern either. Employees using work and personal devices (like tablets, mobile phones and laptops) at home, in public and within your workplace make security more complex. Therefore, if every employee is connected via an intelligent cloud system, it guarantees a minimum level of security across the business. Cloud is reinventing the way businesses function and protect themselves. Businesses leveraging intelligent cloud systems serve to gain efficiency, flexibility and accountability. This all adds up to create a fulfilling working environment, boosting employee engagement and productivity for years to come.